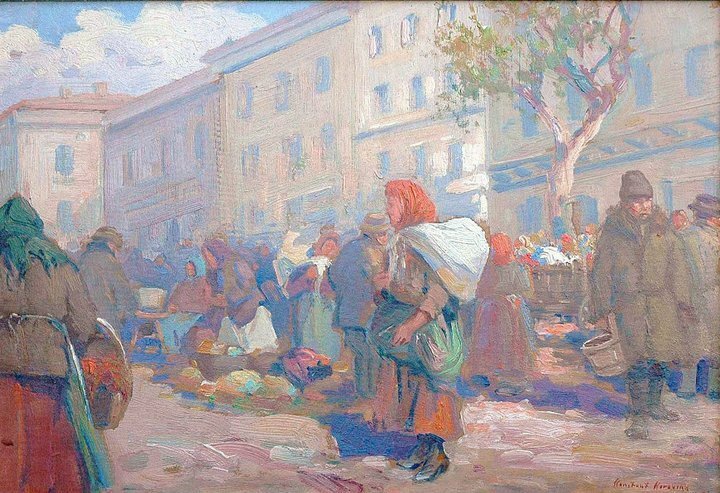 The painting of Russian Peasants in the market place. Is oil on canvas measures 12.5 x18 inches is part of the F.A.M Collection. Konstantin Korovin was Russian painter, master of realistic plein-air painting. He painted emotional landscapes and conversations. Under influence of impressionism he has developed a free decorative manner. Korovin created colourful entertainment theatrical scenery. Konstantin Korovin was born in Moscow on December 5th, 1861 into the family of businessmen. His grandfather, a self-made man was the founder of the family business; his father, Alexey Mikhailovich, after graduating from the University had to go into business as well, though he never liked it and was more interested in art and music. As a result, soon after the grandfather’s death the family went bankrupt and had to move into the country. Constantin and his younger brother, Sergey, also a future artist, were brought up in an artistic atmosphere, they received drawing and painting lessons since their childhood. At School Korovin became friends with I.Levitan. In 1881-1882, Korovin spent a year at the Academy in St.Petersburg, but returned disappointed to Moscow. That year a new professor came to the Moscow School, a distinguished painter Vasily Polenov, who impressed his students not only with his painting but also with his knowledge and enthusiastic attitude towards contemporary Western art, especially French. Korovin stayed with the new teacher at the Moscow School until 1886. Polenov introduced his student to the famous patron of arts Savva Mamontov and his Abramtsevo group. The group included artists who favored the school of national romanticism in Russia. They were the first in the country to stage operas, produce experimental architectural works and design books in the new (‘neo-Russian’) style. They projected the image of a universal artist: painter, furniture and tableware designer, designer of stage costumes and settings, architect. With Polenov’s recommendation S.Mamontov invited Korovin to work for his private opera. Thus Korovin got engaged with theatre, for which he worked till the end of his life. Korovin was the first to introduce the Impressionist style on stage. In 1885, Korovin made his first of many trips to Paris and Spain. ‘Paris was a shock for me: Impressionists: in them I found everything for what I was scolded back at home, in Moscow.’ In 1888, Korovin traveled with S.Mamontov to Italy, then visited Spain, where he painted one of his best works In Front of the Balcony: Leonora and Ampara. The artist traveled widely within Russia, Caucasus and Central Asia, exhibited with the Itinerants’ Society of Traveling Exhibitions (‘Wanderers’), painting in an Impressionist and later an Art Nouveau style. In the 1890s, Korovin became very active in the World of Art group (‘Mir Iskusstva’). These artists adopted a new aesthetic approach to the world’s artistic heritage; they popularized the traditions of folk art and of Russian art of the eighteenth and early nineteenth centuries. At the beginning of the twentieth century Korovin began to take a more close interest in the theatre. Working for the Bolshoi theatre he upheld new principles in designing operas and ballets. His evolution as a stage artist is directly linked to his mature painting. The peculiar features of the Russian Impressionist school became increasingly pronounced in his works of this period: the predilection for decorative effects, the emphatically expressive coloristic solutions and the pronounced romantic note. Korovin’s subjects were quite diverse, they included townscapes and rural landscapes, portraits and still lifes. In 1893, Korovin returned from Europe, dazzled by French Impressionism. The painter, who understood that Russian nature required a different style, made this landscape particularly warm. The landscape gives the impression of being a welcoming and intimate interior. The wide open gate, the sleigh harnessed to the horse and the half open door of the house indicate a human presence. It is one of the most intimate and personal of Russian landscapes; the harmony between man and nature is omnipresent. The studied use of shades of pearl may at first glance be somewhat tiresome, but the rich greys and yellows, and the blue of the sky, are striking. This painting is not a rejection of Impressionism but a search for a Russian variant thereof. By muting the resonance of the colors and varying the cold and warm shades, Korovin was able to represent the variations of light in the atmosphere. This work, and the artist’s trip to Northern Russia in 1894, were an important period in Korovin’s creative history, freeing him from the influences of other painters and allowing him to find his own style.